Newman was one of the better pure hitters in the 2015 draft, having won the last two Cape Cod League batting titles and hit .370 in his junior season at Arizona. He seldom strikes out, but also may not hit for much power. He had just two homers in his junior season and didn’t hit any his first two seasons. He was 22-for-25 in stolen bases and so could profile as a top-of-the-order hitter. Exactly how valuable he becomes will turn largely on whether he can stay at short, as not all observers are convinced he has the range to do so. Some scouts consider his arm either average or above, while others aren’t sure it’s sufficient for short. Baseball America ranked him 29th among draft prospects, while Keith Law ranked him second and projected him to be an excellent defensive shortstop. The Pirates’ selection of Newman came as a surprise, as they’d been almost universally linked to prep pitching. The pick may have been influenced by a conviction that high-contact hitters will have more success against fireballing pitchers and increasingly common shifts; in other words, it may have been the flip side of the Pirates’ heavy use of shifts. Newman signed quickly after the draft for a little below the slot value of $2.273M. Kramer got off to a slow start at Morgantown, causing one faux prospect commentator to declare him a bust a few weeks into his pro career. The Pirates promoted Newman to low A anyway, probably because it became clear that Cole Tucker wouldn’t be returning from his shoulder injury in 2015. After starting off 2-for-18 there, Newman got hot and went 28-for-80 (.350) the rest of the way, controlling the strike zone much better than he had at Morgantown. Newman actually showed a little power with Morgantown, but not with the Power. He did a good job of stealing bases. He had a large platoon split, posting an OPS of .872 against LHPs and .584 against RHPs. Baseball America rated him the seventh best prospect in the NYPL, with league managers expressing doubt about whether Newman would stay at short but also thinking he might eventually hit for some power. He didn’t have enough ABs to qualify for the SAL list. Tucker’s injury probably removed any issue about assignments, leaving the Pirates to send Newman to Bradenton. That’s what they typically do with an early round college draftee in his first full season. As the numbers show, Newman had little trouble with the pitching there, despite the offense-suppressing nature of the Florida State League. In late May, Newman was hit in the fact with a pitch and was thought to have suffered an orbital fracture, which could have kept him out for a couple months. The injury proved to be less serious, though, and he missed less than three weeks. 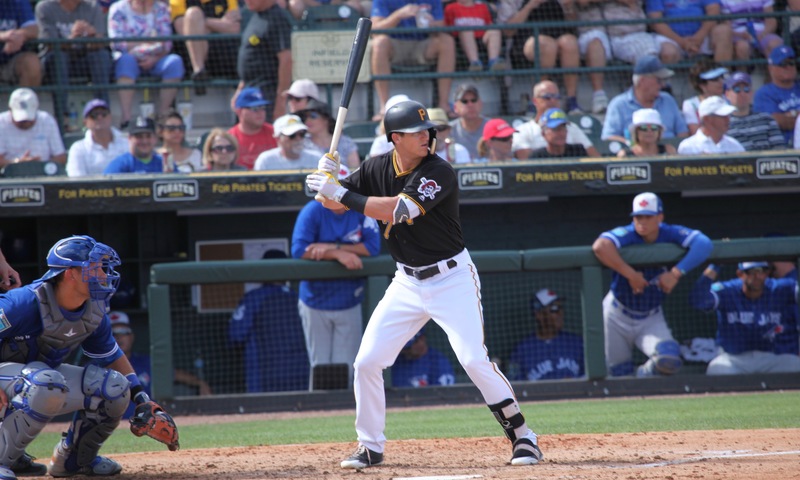 The Pirates had moved Tucker up to Bradenton when Newman went out, so when Newman went 7-for-11 in his first three games back, the team promoted him to Altoona. Newman started off hot there as well, batting .324 through the end of July. He slumped after that, batting just .227 from August 1 to the end of the season. The Pirates moved him from the leadoff spot to the #3 spot at the beginning of August. They believed he was seeing too many fastballs batting leadoff, although Harold Ramirez being traded at the end of July probably played a role, too. Whatever the reason, Newman didn’t exactly struggle badly. He struck out only nine times in his last 103 plate appearances and drew 11 walks. In fact, he had a good walk rate and very low K rate throughout the season. For the year his OPS was .850 against LHPs and .804 against RHPs. He also stole bases well enough to be a threat. Defensively, he showed probably just solid range, but he was extremely reliable, committing only six errors with Bradenton and just two in 60 games for Altoona. Baseball America ranked Newman the third best prospect in the Florida State League and 19th in a very strong Eastern League. Newman had a disappointing season. He started off at Altoona and had a decent first month, but he cratered in May, batting 172/234/253. He rebounded in June and July, batting 307/339/398 through July 20, when the Pirates promoted him to Indianapolis. He hit for a solid average and some gap power, the his walk rate dropped sharply, leaving him with a weak OBP. On the season, Newman struggled with RHP, posting just a .653 OPS against them. On defense he remained very reliable. Newman went back to AAA and got off to a very slow start, with just a .565 OPS in April. He got going after that and eventually got his average over .300 while finishing fifth in the International League in doubles. He seldom struck out, but didn’t have a high walk rate. He also started running a lot more than he had previously and finished second in the league in steals, although his success rate wasn’t great. He played very well defensively and was voted the league’s top defensive shortstop. The Pirates called Newman up in mid-August when Jordy Mercer got hurt, but he played little at first because they also obtained Adeiny Hechavarria. They finally started playing him semi-regularly in September after they’d traded Hechavarria. Newman struggled at the plate, with uncharacteristic strikeout problems. He made three errors in 24 games at short, which sent some fans into hysterical overreactions. Newman doesn’t have a high ceiling. Offensively, it’s very likely that he’ll hit for a decent to good average, but without many walks or much power at all. He should provide good defense and some speed. The Pirates, though, seemed to write him off as a starting shortstop after his weak showing in late 2018. They traded for 27-year-old utility infielder Erik Gonzalez and more or less tabbed him as the favorite to start at short going into spring training. They followed up by announcing well before the end of camp that Gonzalez would indeed be the starter. With Cole Tucker now regarded as the long-term answer at short for the team, Newman’s window to be the starter may have closed before it ever really opened. June 8, 2015: Drafted by the Pittsburgh Pirates in the 1st round, 19th overall pick; signed on June 15. August 16, 2018: Contract purchased by the Pittsburgh Pirates.